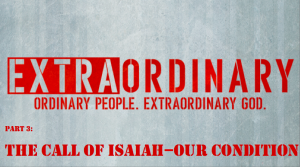 A couple of weeks ago, we saw how God called the prophet Isaiah into ministry. 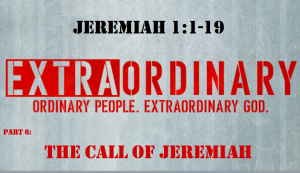 This week we’ll see Jeremiah’s encpunter with God that leads to his prophetic ministry. How much do you know about the prophet Jeremiah? This week we will look at an encounter with God that started his prophetic ministry to the people of Judah. To prepare, read Jeremiah 1:1-19 and consider Jeremiah’s concerns and God’s answer. We see how God meets Naaman at the point of his greatest need. 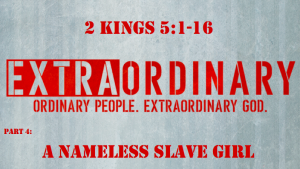 Before we could see his encounter with God, we saw how God used a young Israelite slave girl to set up the meeting. Even though she was in a place she didn’t plan on being with people she didn’t plan on being with– and probably didn’t like it– she tells Naaman that the answer to his problem can be found in the God of Israel. 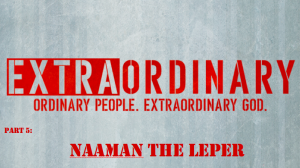 This week we will see Naaman travel to Israel and meet God in an unexpected way. What is it like to have an encounter with God? As we look at a Syrian military commander, we see that God puts his people into positions to build his kingdom and do his work. He will put us into those positions as well. How will you respond? This week we will look at a man who has an unexpected encounter with God that changes everything in his life. His name is Naaman and he is a Syrian military commander. As successful as Naaman is, he has a problem that all of his wealth and accomplishments can do nothing to solve. What is it like to have an encounter with God? As we look at Isaiah, we see what he experiences and learn some powerful lessons for our encounters with God today. This week we will continue to look at the Call of Isaiah. Last week we saw a vision of God, and we learned that he is seated on his throne in control of all that is happening in the world. Now we will see how Isaiah responds to this reality. To prepare, read Isaiah 6:1-8. Thanks to everyone who participated in our potluck lunch last Sunday. Great food and great people!